A crucial 11-day spell for Kettering Town’s Evo-Stik League South Premier Division Central title hopes starts at Latimer Park this evening (Tuesday). 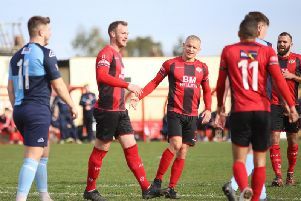 The Poppies fell four points behind leaders Stourbridge at the weekend as the Glassboys picked up a 2-0 victory over Banbury United while Marcus Law’s team needed a late Aaron O’Connor goal to secure a 2-2 draw at play-off chasing Coalville Town. Kettering are now preparing to play the first of three games in hand against another play-off contender Biggleswade Town tonight while further home clashes against Royston Town and Coalville follow on before they head to Stourbridge on January 26. But, as his team gear up for a vital period of the season, Law has been left questioning decisions he feels are going against his side. The Poppies felt they had two big shouts for penalties during Saturday’s stalemate, including one in the dying moments when Rhys Hoenes appeared to be brought down in the area. And Law believes his team could be, quite literally, paying the penalty when it comes to key decisions at the moment. “I spoke with the referee afterwards in a calm manner and he told me his perspective and what he saw,” the Poppies boss, who admitted the draw at Coalville was a fair result, said. “The second one with Rhys, I thought their player came across our player with no intent for the ball. I thought it was a big decision and I spoke with them (the officials) and they told me what they saw. “I just asked whether there were any preconceptions before the game because we are fully aware that a lot of our play has been involved in referees’ seminars. “And ever since I have had that knowledge, it just seems quite obvious that the body language from officials suggests they aren’t interested. That is an opinion. “There was one incident in the first half where he didn’t even look at it, he wasn’t interested whatsoever and that was a close call. Law, meanwhile, knows his team are in for another stern test this evening against a Biggleswade side who had their Buildbase FA Trophy hopes ended in a narrow 1-0 defeat at Vanarama National League team AFC Fylde at the weekend. While the Poppies will be looking to move to within a point of top spot, Biggleswade will be hoping to move back into the play-off positions. And Law added: “They are a very strong outfit, which has been proven by how far they got in the FA Trophy. The Poppies will be checking up on the fitness of both Brett Solkhon (calf) and Adam Cunnington (calf) after both were withdrawn during the draw at Coalville.